Each page has two columns. The left column has categories of information that are consistent from page to page, such as time of day, color, astrological sign, impetus, quick take on harmony/ disharmony, critical age, and quickies for harmonizing, as well as the associated depth and its various correlations. 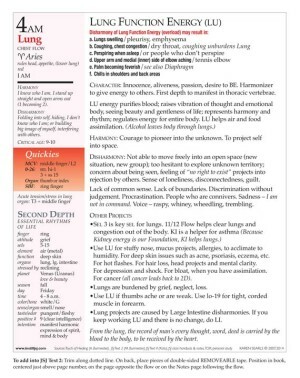 The right column is more variable in its content, generally including the character associated with a particular organ function, what it looks like in harmony and disharmony, projects that benefit from the flow and notes about an organ function that might elucidate a better understanding of the flow. Some of this material comes from published resources; much of it is from class notes and personal study and is, therefore, not comprehensive in the sense that it is limited to the teachers, classes and books I’ve connected with. 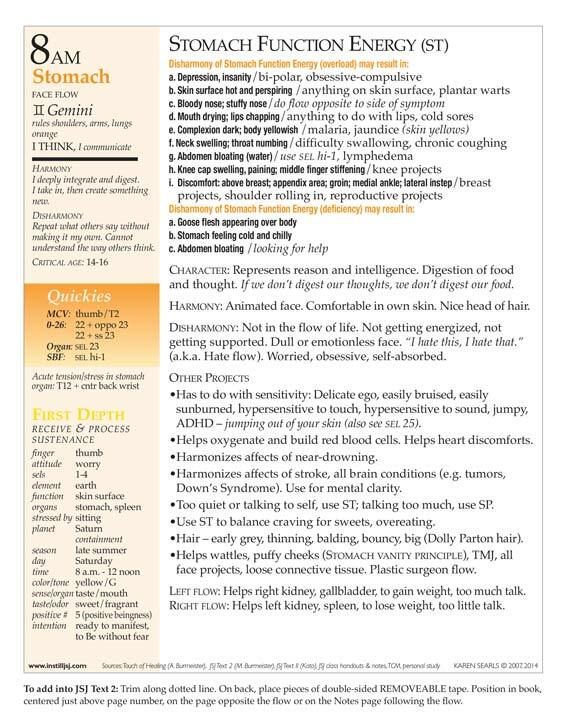 Each organ function page can be trimmed and added right in to your text for quick and easy access while you are working. There is also room on the 8.5 x 11 page for a three-hole punch in order to put the pages in a standard-size notebook, if you prefer. Organ Function Information Set © copyright 2014, Karen Searls. All rights reserved. The Organ Function Information Set is for your personal use and does not come with distribution rights. No part of this chart may be reproduced, stored in a retrievable system, or transmitted in any form or by any means – electronically, mechanical, photocopying, recording, or otherwise – without written permission of the copyright holder.